Have you ever wanted to know how to integrating Facebook ‘Like Box’ button to your personal website or blog? While adding the ‘like button’ may look very complex as it does some ajaxing and server side code validation, its very easy to do. To be honest you can add a like button within 5 minutes. Just follow these simple instructions and your Joomla site can become part of the Facebook social network. As you already know ( I hope!) adding a Like button will allow people to “like” your site as well as the content on your site, and connect to the Facebook page that represents your web site. 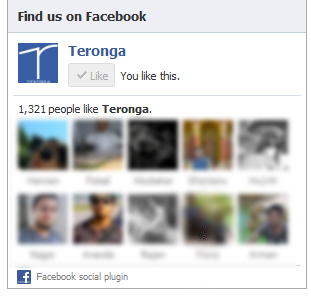 Enter the page number (found in your Facebook page URL) of your Facebook page. If you don’t have one, go to Facebook Create Page wizard and create a Brand >> Website page for your site. Click the Get Code button to generate the Facebook Code. Paste the code into the HTML box (make sure the editor is turned off). That’s it. It’s so simple. Isn’t it? Please give your feed back on this article and make sure you keep coming back to view some cool and useful articles. See you in the next post. Till then have a healthy and happy life. If a blog has many users or writers then it is difficult to maintain roles without an automated system for managing users. For this matter WordPress allows us to define user roles. This allows the admin or the owner of the WordPress blog to allow some functions like publishing a post or editing a post to certain users. With Blogger.com under the permissions we can manage various users on a blog. The settings include assigning certain roles to users. This means some users can publish posts while others might have wider options which includes administration of the blog. Now lets see how we can add and manage Users with WordPress. In WordPress we can start by clicking on the Users options as seen below. As shown in the image we can see a list of all users on the blog. Selecting on of the users we can change the role of that user to an Admin, Editor, Author, Contributor. 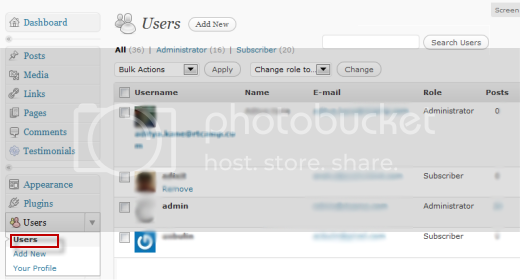 Admin can edit any details including change theme, disable or enable plugins along with adding and managing other users. An Editor can edit all posts along with writing and publishing post on the blog. Editor can also approve of comments. An Editor cannot make changes to the theme, plugins or even change role of a particular user. Author can write and publish posts on the blog. Authors cannot approve of comments either. Contributors can comment on posts which are already published and along with that, write posts on the blog. These posts do not get published but are saved as Pending which can be Published only by Editor or the Admin. Under the Users option on the Dashboard we can see Add New. This allows the admin to create new users who can login and lookup the dashboard of WordPress blog. Admin can also allow users to register themselves with the WordPress blog directly without the need for Admin to create new users manually. This can be done through Settings > General > Select Anyone can register. Just like Blogger.com we can also specify roles for someone registered as a user on the blog with WordPress. We can add new users directly from the dashboard and also allot with roles. Tools are the vital feature of WordPress for Bloggers to manage their blogs. Tools in WordPress as well as in Blogger.com blog are used to import and export blog contents. WordPress provides us a lot more extra features than Blogger.com. WordPress also gives us similar options for import and export posts and comments from many other blogging platform. You can find three options Tools, Import and Export. 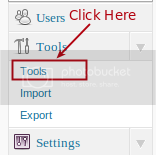 Click on Tools menu it will help for quick posting from your favorite blog. This option gives you a facility for Press This and Use This tools. The Press This tool allows quick posting and publishing through the use of a special web browser that you want to share. You can create a shortcut to allow “Press This” in your browser’s tool bar. 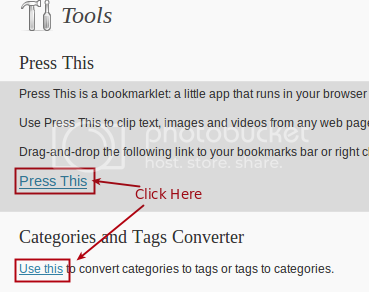 “Press This” is a cool and convenient way to get content,images and videos that you would like to share on your blog. The Use This tool is used to convert Categories into Tags and vice-versa. In Blogger.com Import tool only imports the content from other blog’s xml file, but WordPress Import tool imports content from many other services. In Blogger.com Export option downloads all the content from your blog, but in WordPress Export is used to download all the content of WordPress blog into your local computer system with many options, while exporting content like Date, Authors, Categories, Content type and Status. On Blogger.com you can easily import from another blog in blogger whereas with WordPress you can import a blog from Blogger.com, Live Journal, Type Pad and obviously WordPress. 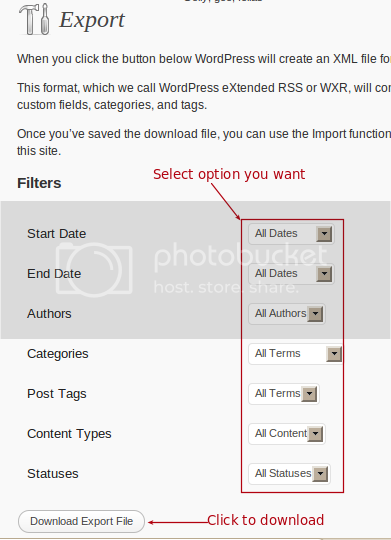 WordPress’s export gives us great number of additional options to specifically download certain type of content like categories, authors, post tags etc. In a WordPress blog we see there are a certain number of posts showing on the homepage along with date and time of publishing. We can change the number of posts and various settings like permalink, feed etc. These are some of the settings in WordPress which are managed in WordPress with the Settings menu in the Dashboard. With all these options we can Import and Export content, set the Blog Title and Description, format of the blog, handle the comments and manage archives, email, Permissions, etc. You might be aware of the Settings in Blogger.com and I thought a comparative feature by feature explanation would be useful. In Blogger.com under Basic option you can add Title and Description of site, like the same way you find options under Setting -> General in WordPress and also option for site URL. In Blogger.com under Basic option you had options like “Search Engine“, “Blog Listing“, etc. You can find it in WordPress under Settings -> Privacy. In Blogger.com options like “Show at most” and “Time and Date Formating” are in Formatting option. The same options are found in WordPress under Setting -> General and Setting -> Reading. 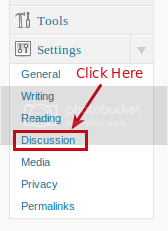 In Blogger.com there is an option for Comments, but in WordPress all the options about comments you can find under Setting -> Discussion. We can also moderate comments under the option Comments (below Pages menu). Blogger.com gives option Site Feed for “Allow Blog Feeds” and “Post Feed Redirect URL”, but WordPress by default gives you feed URL, if you want to redirect your feed to your “Feedburner” URL then you can use FeedBurner FeedSmith plugin ( see Managing Plugins in WordPress). There are further settings in Blogger.com like importing and exporting blogs which can be covered under the Tools menu in WordPress. Do check out All about Tools in WordPress for more details. Plugins and certain themes when used give us some extra settings options which we can tweak. These options often show up under the Settings Menu on the left side bar of the Dashboard. When we use Blogger.com settings it has some limited scope regarding what can be customized. With WordPress there is a lot more flexibility regarding how we can tweak settings of the blog. Comments play a vital role in any blog. Comments are a way readers communicate & express their views on a particular website. Comments are basically views and opinions expressed by readers about a particular post. If you are a Blogger.com user, you might be familiar with comment moderation and also its various options. 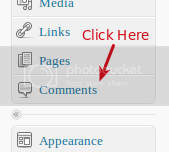 In Blogger.com we have two options for comments, one is under Settings -> Comments menu and other is under Posting -> Comments. So, How it actually works with WordPress! For Comments moderation in WordPress, click on Comments menu. You will get a list of comments of your blog posts with Author identity and on which post comments are posted. The options are to approve, edit, reply, spam and trash any comments when we hover over with the mouse on comment. You can also search comments. 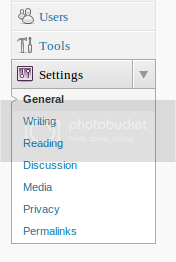 Click on Settings -> Discussion menu to get all the settings about comments. Default article settings : Notify blogs linked from the article, pingbacks and trackbacks, allow comments. Other comment settings : Name and email is required, user has to be logged in for posting comments. Comments are closed automatically and so on. E-mail me whenever : Notification through email is sent whenever a comment is posted or when a comment is held for moderation. Comment Moderation : You can add URL, email id or IP address in text area to do comment moderation, it will show all the comments in comments menu. Comment Blacklist : You can add URL, email id or IP address in text area to span comments. Avatar : Avatar is user profile picture that will be shown with comments. You can select the default Avatar for those who doesn’t registered in gravatar.com. Beware of Comment Spammer: Take actions! Every WordPress blog has Akismet plugin as a default plugin which is also useful for comment moderation. All you need to do is activate it and get your API key from Akismet.com. So, Start Moderating your Comments! When it comes to Comment management with WordPress in comparison with Blogger.com there are many similarities. Almost all blogger features regarding comments are also available in WordPress. WordPress does give a great way to control spam through comments with features like Comment Moderation and Comment Blacklist as explained above. Hope you enjoyed our series so far. Below are our previous posts of the “Be A Blogger Series” Part 1 to Part 6. We’ll appreciate your feedback!